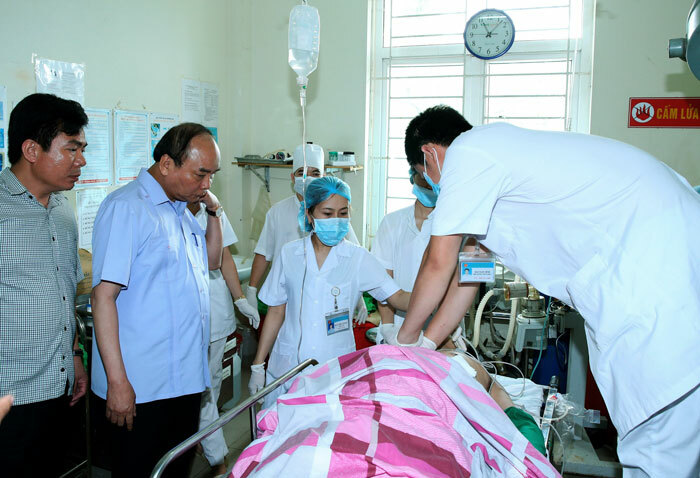 Vietnam's Prime Minister Nguyen Xuan Phuc (2L) looks at one of the victims of a shooting at a local hospital in the northern province of Yen Bai, August 18, 2016. Two top provincial officials of Vietnam’s ruling Communist Party were shot to death by a forest ranger who later killed himself in a rare firearms-related killing in the Southeast Asian country, according to state media accounts. The officials were killed Thursday in the northern province of Yen Bai, just before a meeting of the local People’s Council, the official Vietnam News Agency said. It identified the gunman as Do Cuong Minh, the leader of Yen Bai’s forest ranger unit. The victims were identified as Pham Duy Cuong, the province’s Communist Party secretary, and Ngo Ngoc Tuan, the chairman of the People’s Council, the news agency said. Police officials said the men were shot multiple times with Minh’s service revolver. Gun ownership is tightly controlled in Vietnam, but Minh was allowed to carry a weapon in his official capacity, the news service reported. While a motive for the shooting was not given, police told Thanhnien News they have no plans to launch a criminal investigation into the shooting since the suspect killed himself. Police were searching the 53-year-old forest ranger’s house and office but had yet to find a suicide note, according to state media reports. Maj. Gen. Dang Tran Chieu, Director of the Public Security Department of Yen Bai, told reporters in a press conference that the decision on the criminal investigation follows Vietnamese law. Local officials at the press conference said they would still work to discover the shooter's motive. They rejected speculation that the shooting had to do with the ongoing reshuffling of local government staff. The government plans to merge Minh's Forest Ranger Office and the Agriculture Office of Yen Bai, but Pham Thi Thanh Tra, chairman of the local People's Committee, denied there was a link to the shooting, state media said. Local police and military have been instructed to maintain public order and stability in Yen Bai, a mountainous province northwest of the capital Hanoi, VTV reported. Tra also told reporters that there was no link between the killing and recent reports of illegal logging in province. “This incident is not related to illegal logging in Yen Bai. In illegal logging cases, district authorities are responsible, there is no mention of the forest protection agency, so that has nothing to do with Minh’s actions,” Tra told reporters, according to a Channel New Asia report. The shooting and official statements failed to quell speculation about the killings. Others weren’t so sure, as some government critics saw the shooting as another sign of anger over a corrupt regime. “Nobody is crazy enough to shoot others like that,” said Nguyen Khac Mai, a former chief of the research board of the party’s central public relations committee. While it’s difficult to tell if the killings were politically motivated or came from a personal dispute, Vietnamese freelance journalist Pham Chi Dung called the killings a visible manifestation of the problems that are boiling under the surface in the party. “At the moment we don’t know if it is because of personal conflict or a professional one, but because it involved such high-ranking officials, it must be very big and very dangerous for the party, pushing the party to the edge of a cliff,” he said. Reported by RFA's Vietnamese Service. Translated by Viet Ha. Written in English by Brooks Boliek. Uh-Duh! It takes one to know one. This isn't about personal issues then why all these 'big shots' are coming down? Unless they have nothing else better to do - bore out of their minds? I think they know the very unstable fabric that they built is about to tear. I just can't wait for that day! God's plans will play out and the people are longing for justice. Bring it!